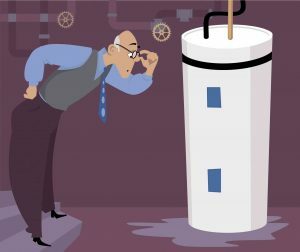 Why Do You Have a Leaky Water Heater? A leaky water heater can be a sign of a serious problem. There might be nothing more frightening as a homeowner than to find a puddle of water underneath your water heater. Leaks from the bottom of the tank are most common and they can be a cause of major stress. Sometimes these problems have simple fixes, but they may also indicate that you need a brand new water heater installed. So why exactly do you have a leaky water heater? The temperature and pressure relief valve is an essential part of a water heater. It is designed to release water whenever there is too much pressure in the tank or the water gets too hot. When either of these things happens, the valve discharges water towards the floor using a discharge tube. Check the inside of this tube for moisture. If there’s any water, the temperature and pressure relief valve is most likely the cause of your leaky water heater – either the valve is faulty or there’s too much pressure within the tank. Water heaters have drain valves at the bottom of the tank which are used any time a tank is drained to remove the sediment that builds up in it. Sometimes this valve is faulty and will begin to leak water that pools at the bottom of the tank. Water can also start seeping out of the edges of the valve if it isn’t air-tight. Usually, replacing this valve will solve the problem. Most of the time a leaky water heater has a problem with the hot water tank. A tank will leak primarily because there’s something wrong with it on the inside. It’s probable that one of the components has sprung a leak and is causing water to seep out to the bottom slowly. Internal sediment buildup is usually the cause of this – this sediment cracks and rusts the tank over time. If this is the cause of your leaky water heater, unfortunately, the only fix will be a replacement. You should contact a professional plumber right away. Give Master Plumbing a call at (301) 650-9100 or contact us online to get more information on how our expert plumbers can help you with your leaky water heater (or just about anything else plumbing related!). We have received Angie’s List Super Service Award recognition for plumbing and drain cleaning every year since 2007, in addition to the Best Plumber award from Best of Bethesda. We are fully licensed, bonded, and insured and our service is unparalleled. Give us a call today—you won’t regret it! To see examples of our projects, follow us on Facebook, Twitter, and Pinterest. This entry was posted on Friday, January 20th, 2017 at 4:05 pm. Both comments and pings are currently closed.